WASHINGTON, DC - (@The Comedy News) - Vice President Joe Biden came to the U.S. Senate floor today to exude his only real Constitutional duty-- to break ties in the Senate. However, he chose to interpret his Constitutional duty as he had to literally take a necktie and break it into pieces. When the Vice President arrived on the floor and silently grinned his trademark smile, he pulled out a brand new red and blue-striped necktie and proceeded to break it into pieces with his bare hands. 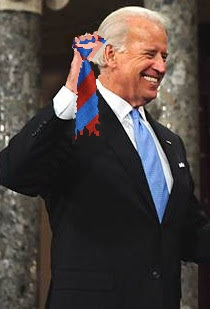 "Once that tie came out of his pocket, we knew exactly what ol' Joe was gonna do", a Senate Page reported. "We hear stories about how much of a goof he was when he was a Senator. And now, out of forty-seven Vice Presidents in U.S. history, Joe is the first that I know of to come to the floor and rip a tie to pieces---and then defend his behavior as his 'Constitutional duty'. Article I, Section 3, Clause 4 of the United States Constitution states that “the Vice President of the United States shall be President of the Senate, but shall have no Vote, unless they be equally divided". There is no mention of neckties.